Whether its a small area or your entire yard we have the expertise to get the job done right to ensure the long term health of your new turf. 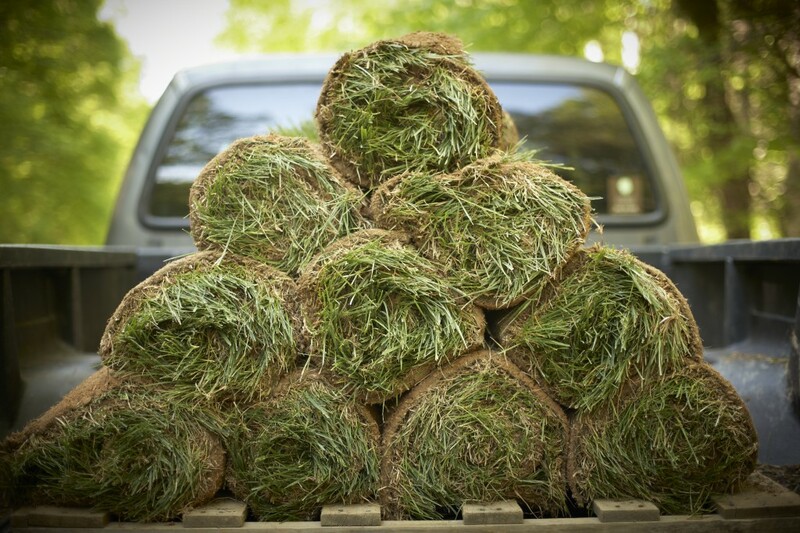 Our turf type tall fescue sod is purchased locally from Riverside Turf in Charles City, Virginia. All sod is cut from the farm, delivered and installed on the same day to ensure turf health. The best times to install sod is in the early Spring, Fall or Winter. Riverside Turf has earned the reputation of a reliable supplier of the finest turf grass throughout the mid-Atlantic region. Don’t let cooler temperatures stop you from installing sod. Fescue is a cool season grass and will root at temperatures as low as 32 degrees. If the ground is frozen, fescue will simply lie dormant until the temperature is warm enough to enable rooting. If you’d like to replace your lawn, contact us to schedule a convenient time for owner Jeff Cartwright to discuss our sodding process. 1 We meet with you at your home to survey and measure the area on your property that you would like to sod. During this survey, we’ll look at the slope of the ground and how it might affect the growth and health of new sod. For example, with steeply sloped areas sod can be pinned to the ground to facilitate rooting. We also examine the current surface condition of the area to determine if there are weeds, invasive species of grass or other problematic issues such as old stumps, or heavy graveled areas that will need to be addressed in preparation for sodding. 2 Weeds and invasive grasses will need to be killed off with Round Up treatments prior to sodding. Old stumps and gravel will need to be removed as such things will hinder the long term health of the sod. This is also the opportune time to fix drainage and run-off issues, and install or update irrigation systems before installing new sod. Once completed, we’ll line trim any killed off weeds or invasive grasses, then collect and remove debris to ensure a clean surface for your new sod. 3 We use edging shovels to skim off about two to three inches of the ground near the perimeter of your lawn border. This will allow your new sod to lie flush against any curbs, walks, driveway and planting beds. 4 Prior to laying sod, it is imperative that a layer of topsoil and organic, nutrient-rich compost mix be spread at a depth of about one inch across the surface of your lawn area. This ensures the new sod has loose, high nutrient soil in which it can easily root into after installation. And, based on the make-up of your soil, we’ll custom mix and spread lime and fertilizer to balance the soil’s Ph to assist with the sod’s long term health. 5 Immediately after the ground has properly been prepared, sod is delivered from Riverside Turf and installed the same day. To preserve the appearance and long-term health of your new sod, it will be laid in a staggered fashion with all pieces rolled out in the same direction. Appropriate care will be given when laying sod on sloped areas, with precise cuts when laying sod next to hard-surface borders and planting beds. 6 Once the sod has been installed, we’ll water the new turf to get it acclimated to its new surface, and provide you with instructions to care for your new lawn. The first few weeks after installation are critical as the sod must be watered as instructed and foot traffic on the new surface must be kept to a minimum. It will your new sod take about three weeks to root, after which time you can reduce watering and resume normal foot traffic on the new surface.